Water transport is the cheapest type of transport. Baku- the beginning point of all sea transport of Azerbaijan is the largest port in the Caspian. It is possible to swim from Baku to Astrakhan, Makhachkala, Central Asia, and to the Anzali port of Iran. Azerbaijan has access to the world ocean via Caspian → Volga river → Volga — the Don channel → Don river → Azov sea. Besides the Volga-Don channel, Azerbaijan ships have direct access to the world ocean via Volga-Baltic and Baltic-White sea channels. Baku-Turkmenbashy, Baku-Aktau and Baku-Bekdas railway ferry crossing connects two coasts in 11 hours. In the Caspian sea, oil is carried with tankers. Baku-Astrakhan route is blocked in the winter as the north part of the Caspian sea freezes. Most of the ships working on this route carry load to the ports of the Black and Mediterranian seas and bring a lot of currency to Azerbaijan’s budget during that period. 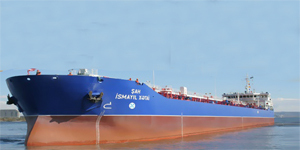 Azerbaijan State Caspian Shipping and Baku Trade Seaport plays a significant role in the water transport of Azerbaijan. The official establishment date of the Caspian Shipping is considered to be May 21, 1958. On this day the “Caucasus and Mercury” Joint-stock Marine Company was established with the decree of the Russian Senate. Until 1992, Caspian Shipping Company was one of the 17 shipping departments of the USSR Marine Fleet Ministry. Afret the collapse of the USSR 7 out of the 15 Soviet Republics inherited the USSR marine fleet. In the Caspian sea only Azerbaijan got the fortune of inheritance. Baku International Trade Seaport was founded in 1902. After Azerbaijan gained independence, the Port became an enterprice independent of the Caspian Shipping Company on January 1, 1992. The Port operates in continuous work schedule for 24 hours throughout the year. The port consists of 5 terminals: 1. The main cargo terminal; 2. The container terminal; 3. The ferry terminal; 4. Dubendi oil terminal; 5. Passenger terminal. The main cargo terminal consists of 7 bridges the total length of which id 858 meters. One of this bridges is especially intended for the access of “RO-RO” vessels. Water depth in the bridges is equal to 7 meters. Technical base consists of 16 portal cranes with 5-40 tons of load capacity, various types of auto-loaders with 1.5-10 tons of load capacity, 100 rolltrailers and pulling tractors of “Sisu” brand. Mainly piece-unit, pile and scattered wood, autotechnical and container cargoes are unloaded in the terminal.The terminal has the capacity of unloading 2 million tons of freight. Throughout the day, 3 vessels, up to 150 carriages, and 100 motor vehicles can be simultaneously received and unloaded. Total lenght of the terminal’s railways is 8 kilometers. The terminal posseses 4 diesel locomotives, locomotive brigade, depot, railway and truck scales for maneuvering. The terminal has an open storage of 24 000 square meters and 5 closed storages the total area of which is 10 000 square meters. The ferry terminal has 2 lift bridges with the lenght of 87 meters. Depth of water near the bridges is nearly 8-10 meters. The ferry is capable of taking 28 carriages or 45 trailer trucks, 202 passengers and 50 automobiles for each run. The terminal has the capacity of unloading 8 million tons of cargo per year. The oil terminal has 4 bridges the total lenght of 582 meters. 2 of them are in operation. The terminal may be used simultaneously for 4 tankers of 5 000-12 000 tons. The depth of water near the baridges is 9.6 meters. The oil terminal has the capacity of unloading 10 million tons of cargo per year. Vessel Traffic Management Service is in the terminal. Two towing vessels of 600 and 1600 weight capacity ensure safe approach of the vessels to the coast. The passenger terminal has a bridge of 130 meters. In the terminal, tour vessels serve to the residents and guests of Baku. Workers of the State Oil Company go to the Caspian oil fields from the passenger terminal. There is a Marine Fleet in Baku Seaport as well. The fleet has 20 vessels including towing vessels, vessels collecting oil wastes, fire-boats, losman boats, vessels for collecting slops and dirty waters, raid boats, crane vessels, tour vessels, fuel vessels. The station building was founded in 1970. The newly repaired station has ferry-boats going to Kazakhstan, Turkmenistan and Russia, two vessels have voyages to the Oil Rocks. There are banquet halls for 120 people, conference halls for 400 people, guestrooms and other service facilities.